Martyn Hilbert's Railway Photography - BR Blues - 47532 at Daisyfield Junction, Blackburn. 47532 at Daisyfield Junction, Blackburn. 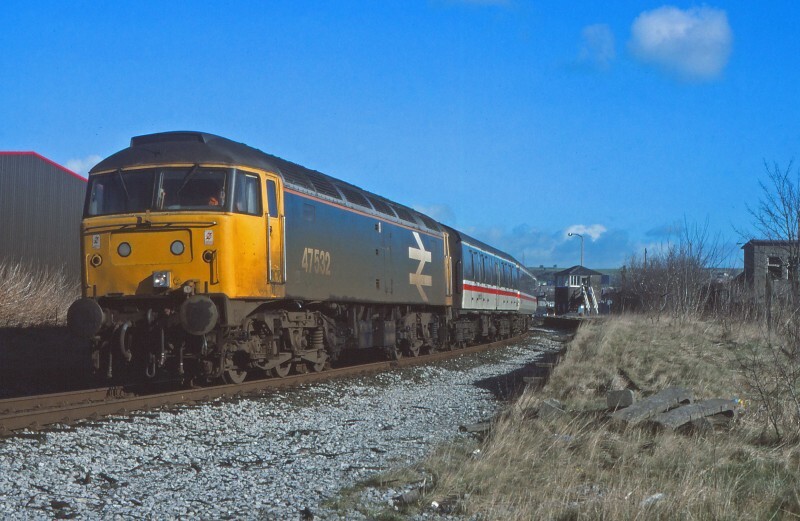 47532 in Large Logo Blue livery brings a diverted Glasgow Central to London Euston through the derelict platforms of Daisyfield Station on the North East side of Blackburn on March 11th 1989. This was in more enlightned days when engineering work on the WCML North of Preston meant a full service diverted via the S&C. Today its all on coaches via the M6, not a good advert for rail. The station at Daisyfield was closed by BR in 1958.